Stylish furniture and a private space for your dog to relax in one? Yes, dog furniture such as a nice crate end table is a perfect way to add unique style to your home while providing a comfortable and safe space for your pooch to relax. Plus, dog kennel end tables are such space savers as well – perfect for busy homes and small apartments! The only problem? A dizzying array of dog furniture on the market. With so many different items to choose from, it can be hard to pick something that both you and your pet will love. But no worries – we’re here to help. We’ve done our research, taking into consideration both dog comfort and furniture style, and came up with a Top 10 list of what we believe are the best dog crate end tables on the market currently. Take a look at the list, as well as our buying guide and FAQ section, to find the right dog crate table for you and your furry friend. 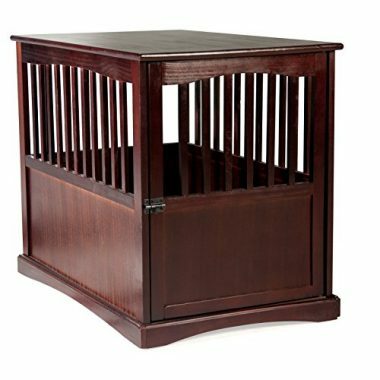 Durable hardwood construction, beautiful design and ultimate comfort for dogs, this wood pet crate end table by Crown Pet Products has it all. Made from sustainable rubberwood (Para rubber tree) that looks very similar to teak, this pet furniture has gorgeous stained and lacquered finish, which only adds to its elegant design. With swing-through doors that rotate inward or outward, the piece is super-versatile, as you can place it pretty much anywhere you feel like. Importantly, the floor of the dog crate table is waterproof melamine-covered, which makes it super-easy to clean, as the crate doesn’t absorb liquid and odor. Also, the crate has multiple vents, which not only provides a well-ventilated environment for your furry companion, but offers a 360-degree view, giving your pet a chance to feel included, even when she wants a bit of privacy. This wooden dog crate is available in two sizes – medium for pets up to 46 pounds, and large for dogs up to 80 pounds – as well as two finishes, so it’s easy to find the piece that will compliment both your home’s décor and your dog’s needs and preferences. Not sure if you want a side table, a nightstand or an end table that doubles as a decorative dog crate? 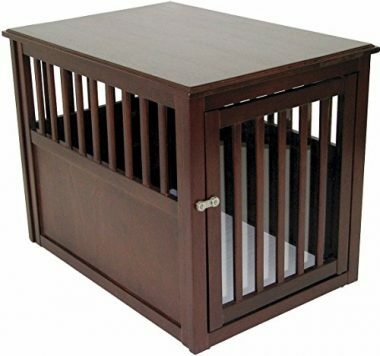 Check out the Internet’s Best dog crate which is pretty much four in one – a wooden dog kennel that can be used as any large accent table, including a regular end table, a side table and even a large nightstand. A perfect piece of pet furniture for indecisive dog parents! Made from solid wood and metal wire (side panels), this dog crate table is built to last. It’s also quite cozy as it’s equipped with a 2.75” dog bed, that is fully padded and removable. This is quite convenient as it means you can just toss it in the washer when needed. 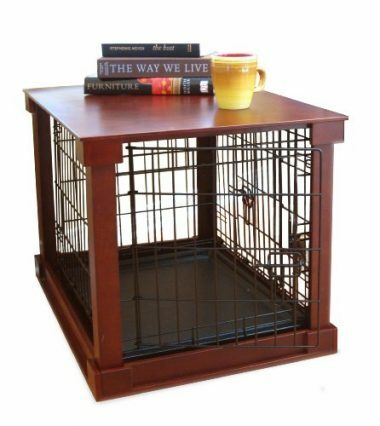 This pet crate end table has double doors for easy accessibility– two entry and exit points –as well as a wide table top, perfect for... well, pretty much anything you can think of, from books and magazines, to potted plants and lamps. This dog kennel furniture comes in one size and two colors: espresso and white. 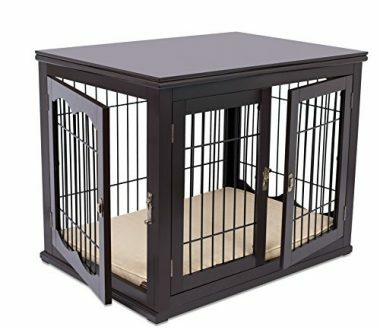 In need of a dog crate and secure pet gate, but not willing to spend money on both? We have the perfect item for you – the Merry Pet 2-in-1 Configurable Pet Crate and Gate is just what you need – a dog crate table and a handy little pet gate in one. Comfortable when a dog needs to rest and reliable when you need to set home boundaries, this pet furniture is all you need to keep your furry companion safe, sound and comfortable. It also helps the crate/gate looks stylish when assembled into the end table – with a solid wood veneer cover, it easily compliments any home décor and instantly makes it look more put-together. Importantly, it comes with a removable plastic tray that protects the flooring and is easy to wash. This 2-in-1 dog furniture is easy to assemble and comes in two sizes, medium and large, and one color (brown). 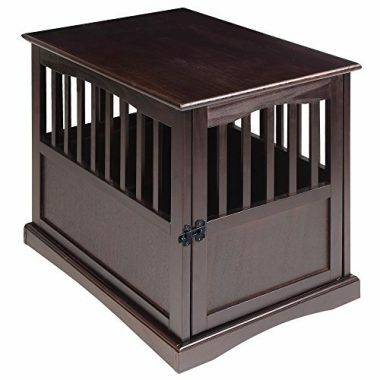 Affordable and chic, this pet crate from Casual Home is a wonderful end table that also doubles as a dog crate. Made of solid wood that is sustainably sourced, with a rich finish, this pet furniture not only looks good, but is durable and made to last for years. 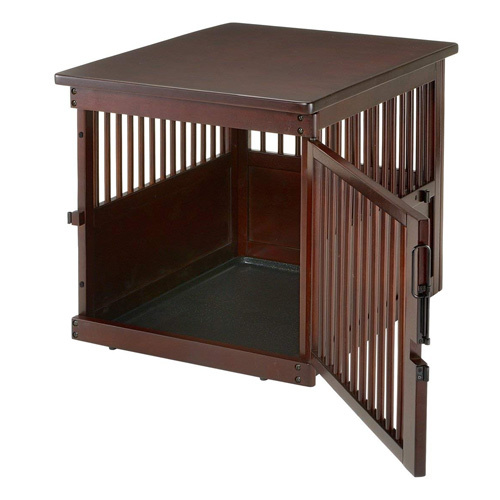 The crate features a lockable gate door, which allows you to quickly and easily lock your pet in case of an emergency. Since the furniture has open side slates, ventilation is good and even when locked, your pooch can freely look around her surroundings. The manufacturer claims the wood itself is chew-resistant, however, it’s always best not to test this – if at all possible, train your dog not to chew on any furniture. 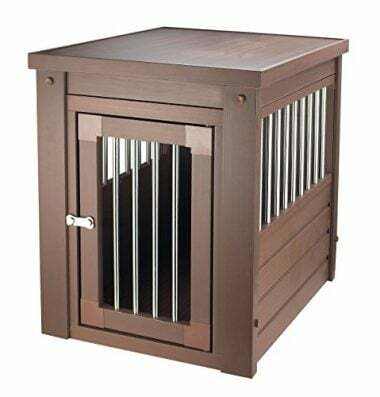 Still, the construction of this dog crate end table is solid and durable, so even if your pet is an occasional chewer, there shouldn’t be any problems. The piece is easy to assemble and comes in various sizes and three colors: black, espresso and white. Stylish and comfortable, the dog crate and end table by Zoovila is a fantastic piece of pet furniture. With “slide aside” door which can be retracted into the crate itself when not needed, this furniture is never in the way – on the contrary, it’s quite functional, as it’s convenient for you and cozy and safe for your dog. The frame of the crate is made of solid wood, while the wires are made from metal. The entire piece is durable and should last for years, provided your furry companion is not a furniture-chewer. The bottom panel is solid and easy to clean, which is always a plus. But the door of the crate is, perhaps, the biggest plus here – they can either hinge or slide into the crate, thereby becoming “invisible” and offering more space. The slide aside crate end table is available in two colors, black and white, and one size. If you need style and function combined, you turn to Merry Products. All their pieces look great and compliment pretty much any home décor, plus, they’re of good quality, guaranteed to keep your dog comfy and safe for years to come. And this particular dog crate end table is no exception – with sleek and solid wood veneer table design and powder coated, sturdy cage, this pet furniture is not only easy on the eyes, it’s also of good quality. The crate comes with a plastic tray at the bottom and it’s completely removable, making the cleanup easy. It’s also fully functional without its wood parts, meaning you can take it with you and your pup anywhere you go. Another plus is that the piece comes with a removable stainless steel divider in the center of the crate, which allows partitioning for the training of puppies. Although this dog crate end table comes in only one color, there are three different sizes to choose from: small, medium and large. This wooden dog kennel that doubles as a decorative end table by Richell features a beautiful construction and a sturdy built. The entire piece is made of durable wood with a gorgeous dark brown finish, so it compliments all home interiors while providing some peace and privacy for your pooch. This space-saving crate end table has multiple vents that not only allow for proper air flow, but provide a 360-degree view for your furry friend. It comes with a removable sliding tray, which is always a huge plus as it allows easy cleaning. As for the door of the furniture, it can be fully opened for easy access (there’s a side stopper included), however, it’s not retractable. The top of the end table is wide enough to store various items, from books to coffee cups to flowers and lamps. 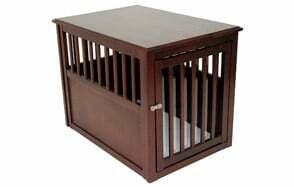 You can get this dog crate end table in two colors, brown and dark brown, and three sizes: small, medium and large. If you want a sturdy, stylish but no-nonsense dog crate end table, the Fashion Luna pet furniture is for you. The entire piece is made of 100% solid wood, which makes the table a great addition to any living room or bedroom, plus, it’s cozy for the dog – it’s a win-win! The Fashion Luna table has many vents that ensure proper ventilation and allow your dog to freely look around even when locked. Since the entire piece is made of wood with a clear, espresso finish, it’s easy to clean it quickly and painlessly. However, it’s worth mentioning that the table has no removable tray and is not chew-proof. In other words, this is a great pet furniture to have – but only if you have an already trained dog. 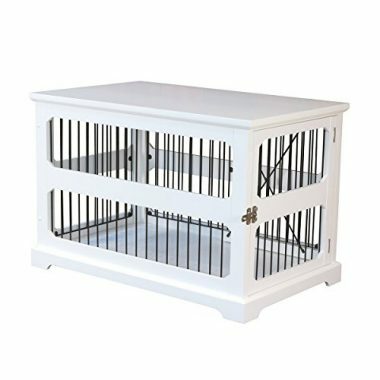 This pet crate table comes in one size and one color. If you need a super-affordable and great-looking dog kennel end table, look no further than the New Age Pet ecoFlex furniture. This pet crate end table is made of ecoFlex, which is a non-toxic recycled plastic-wood polymer composite – ideal for pet parents who not only care about the safety of their dogs but the environment too. This pet crate table combines function and form - it’s convenient as the table top is wide enough to store various items, and space saving as it easily fits any dog or cat. Importantly, it’s also secure, thanks to its stainless steel latch, which allows you to lock your pet in case of an emergency. Like the previous dog crate table though, this one too comes without a removable tray, however, it’s easy to clean as all you need to do is wipe with damp cloth to freshen up the interior (and exterior) space. Although quite sturdy, it’s recommended for already trained pets, as the crate is not chewproof. You can get this furniture in four different colors, as well as four different sizes. The last on our list is a somewhat new item – Polar Bear’s Pet Shop’s dog kennel/end table. This dog crate looks like furniture so much, you can easily pass it as an accent table in any room - it looks great as a coffee table in the living room, a large end table in the bedroom or a simple, decorative table in the basement. 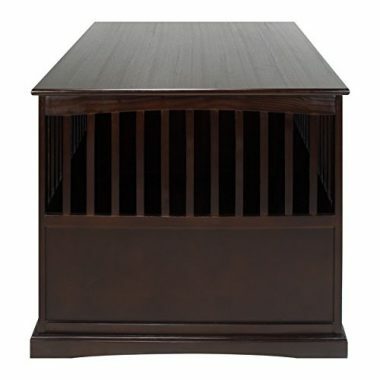 Made of solid wood, with a rich espresso finish, this large pet kennel end table is durable and highly convenient, as it can store various items on top, including books, flowers, lamps, etc. Since it’s quite spacey, it can also fit larger dog breeds with no issues. Although there is no removable tray, this piece is easy to clean with just a damp cloth. It should be said that this pet furniture is suitable for non-chewers only. This wooden end table/kennel comes in only one size and color. Although prices for dog crate end tables can vary widely, most are around $100 to $300. In other words, buying a dog crate end table is no joke – it’s an actual investment. But it’s no wonder really, considering the dual purpose of dog kennel tables – they’re supposed to look stylish and complement your house decor while keeping your dog safe and sound in his little private area. Make sure you’re buying a quality product – something that both you and your pet will love. Additionally, make sure that it is durable and built to last for years. To help you find such a product, we did two things: we created this buying guide and we also answered some of the FAQ. These two chapters cover everything you need to know about dog crate end tables, as well as what to look for when looking to purchase such pet furniture. So, without further ado, let’s get into the important stuff! The most important thing to consider when buying a crate end table is its size. The product needs to fit appropriately into your living room/bedroom or wherever, and it needs to fit your dog comfortably. So, naturally, you want to take careful measurements of both the space you plan to place the furniture in and your dog. Normally, dog crate end tables come in three different sizes: small, medium and large, so it’s easy to see which crate should work best for which dog breed. However, it’s always best to measure your dog’s height and weight – just to be sure. Most crate tables are made of a combination of wood and some other material: the table itself is often made of wood, while the side panels are sometimes made of metal. However, this is not always the case – many pieces are made of wood entirely, and some are made of plastic. Considering that most plastic crate end tables don’t look as good or last as long as wooden/wooden and metal ones, we chose not to feature them on our Top 10 list. Generally speaking, whichever wood you choose, it should last a long time, as long as the construction of the piece is good and your dog is not a chewer. While classic, no-fluff dog kennel furniture works great for most pet owners, some people prefer extra features, such as retracting doors, removable sliding trays, added pillows and configurable crate parts. If that’s you, make sure the furniture you’re eyeing has those added features. For instance, if your dog is quite messy and sometimes even pees inside his crate, a removable, waterproof sliding tray can be a huge plus as it allows for quick and easy cleaning. But if you have a small, busy apartment, something like the retracting door will probably be the most helpful feature. Dog crates that look and function like furniture are such space savers – with just one piece of furniture you get a quality end table that you can use however you like, and a nice, cozy bed for your dog. This is particularly useful for smaller houses and apartments, as you don’t have to get two pieces of furniture but one. With traditional dog beds and wire crates, a pet can feel somewhat left out and even lonely, as these pet beds are usually placed somewhere in the corner. With a dog crate end table, usually located somewhere in the middle of the room, your dog feels more included and as a part of the family. This is beneficial for all dogs, but especially those who suffer from separation anxiety. Have you ever seen a dog hide under a desk or table? That’s a canine looking for a sense of security in the form of a confined space. Dog crates such as crate end tables represent safe spaces for most dogs, which is why many will spend hours inside them and even sleep there. 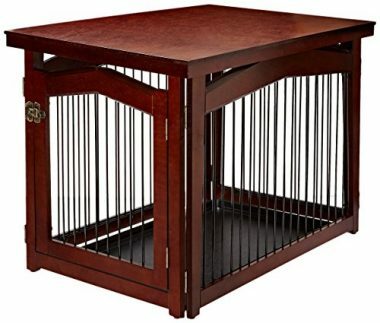 Instead of buying an accent table for your living room and a dog bed or a separate wire crate for your furry friend, you can buy a dog crate end table and kill two birds with one stone. If you choose wisely, you’ll have a great-looking end table that doubles as a dog bed for years. Some people believe that crate end tables require a lot of maintenance to look (and smell) good. In reality, they require no more maintenance than a regular dog bed – in fact, even less than that. If you buy a crate table that comes with a removable slide tray, all you’ll have to do regularly is take that tray out and clean it. And if your kennel table doesn’t come with a removable tray? No problem, as normally, all you need to clean these crate end tables is a damp cloth – nothing else. Of course, if your crate table doesn’t have a waterproof bottom and your pooch pees inside the crate occasionally, you’ll have to do much more maintenance than that. That’s why we recommend you first train your dog before you buy a crate end table. 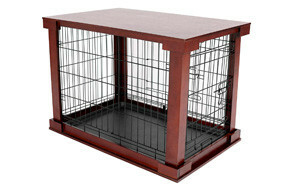 But generally speaking, pet crate end tables require minimum maintenance, depending on your dog and her behavior. You May Also Like Our Review of the Best Dog Crates. Q: Is a dog crate end table appropriate for a large dog? A: Although most dog crate furniture is either of small or medium size, it’s not hard to find large or even extra large crate end tables, which can be completely appropriate for large dog breeds. Still, no matter what the manufacturer claims, it’s always best to measure your dog carefully before buying pet furniture to ensure he can fit comfortably inside. Q: How durable is a dog crate end table? The material of the furniture: wooden or wooden plus metal crate tables are usually quite sturdy and can last for years before they have to be replaced. Plastic crate end tables, on the other hand, are not particularly long-lasting. Your pet: if your dog likes to chew the furniture, including his crate, it’s not likely your end table is going to last a very long time, no matter how sturdy it is. It’s best to train your pet not to chew on things before introducing him to his new crate/end table. How well you maintain it: like all things, dog crate end tables require regular maintenance. If your dog is messy, sheds a lot, and sometimes even pees inside the crate, you’ll need to clean it frequently and thoroughly. If, on the other hand, your pet doesn’t shed a lot and is a well-behaved canine, you may need to clean the crate only occasionally. 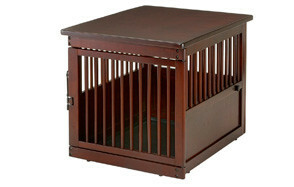 Still, the better both you and your pooch take care of the crate table, the longer it will last. Q: What is a dog crate end table made out of? A: Most dog crate end tables are either made out of wood, or wood + some other material such as metal. These crate tables are usually of great quality, although the wood itself plays an important role in how durable the entire piece will be. Besides wooden decorative dog crates, plastic crate tables can also be found, however, since they’re not of great quality, you won’t find them featured on Our Top Picks. Q: What if my dog chews up the crate? A: Since most dog kennel tables are made out of wood, they’re not chew-proof at all. This means you should only buy this type of pet furniture if your dog is trained not to chew on things. In fact, even if the crate table is advertised as chew-proof, it’s wise to first train your pup not to chomp on things, and then let him use it. Even super-sturdy and durable kennel end tables won’t last long if you have a chewer in the family! Multiple vents that ensure proper air flow and offer your dog a 360-degree view. All in all, this is a fantastic wooden dog crate end table that looks like it would complement any home decor. Plus, it’s durable, easy to maintain and comfy for pets – pretty much the ideal dog furniture!